Following Miguel Bastida & Florian Kaltstrøm’s ‘De Barcelona a Viena EP’ and Two Hand Salute’s ‘Scale Up’ / ‘We Are Drum’ offering, comes a peak-time double-header resulting from a new collaboration between Marco Bailey and Filterheadz. Having just released his new album ‘High Volume’ on his MB Elektronics label, Marco Bailey also regularly releases his work on Bedrock, Intec and Drumcode. Meanwhile, fellow Belgians Filterheadz remixed John Digweed and Nick Muir’s ‘Emerald’ back in 2003 and have been releasing music on labels such as Intec, 1605, Respekt, Toolroom and MB Elektronics for over 10 years now. After a short break, they returned to the techno scene in summer 2012. Having been friends with Marco for over a decade, they started doing some studio sessions together a few months ago and have emerged with these two tracks. 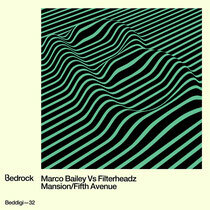 ‘Fifth Avenue’ continues to raise the bar where Marco Bailey’s ‘Watergate EP’ (BED85) left off a couple of years ago, and teamed with ‘Mansion’ it forms a top peak-time package.